MAYA by Laser Distance Spectrometry – When You Need Mass Spec Results NOW! 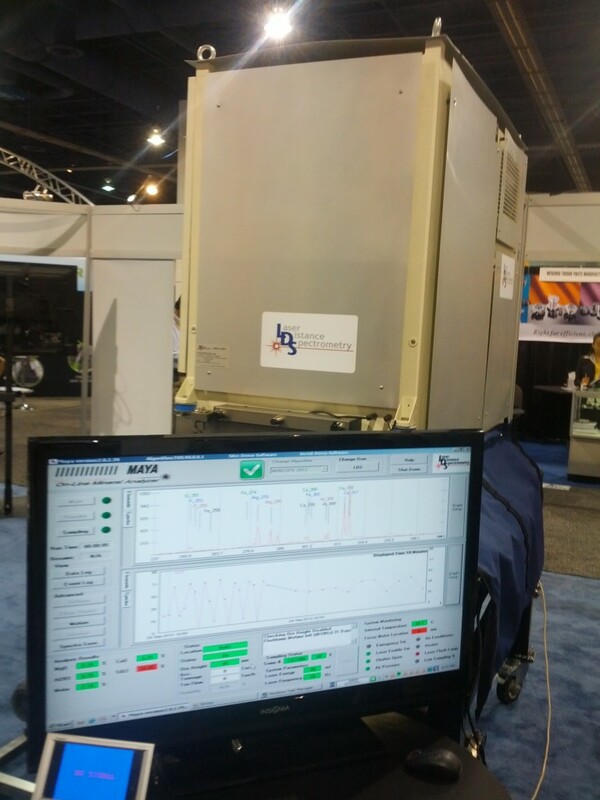 An unexpected encounter at MinExpo yielded the MAYA Spectrometer system by Laser Distance Spectrometry, which is a mass-spectrometry device that uses lasers to obtain measurements, resulting in an extremely fast system. How fast? so fast that it is set up over a crusher conveyor belt, and will take real-time measurements of the material as it passes through. Mineral Concentration – separate high-grade from low-grade material, or send different concentrations (phosphate, for example) to different processing facilities. THe system can easily be integrated into an automated sorting arrangement, such that should waste be running through the crusher (for example) the MAYA system will detect the change in mineralogy and the system can divert the waste material away from the crushing and leaching process. It will scan everything simultaneously and give readouts of individual minerals within each sample, which aids in the differentiation process. Weight – the MAYA system weighs in at 400kg (the unit in the photo above is approximately .5m x 1m x 1.5m, like an old-school picture-tube TV) which puts it at about half the weight of X-Ray or Gamma Ray systems. Safety – the laser used by the MAYA system is significantly safer than X-Ray or Gamma as it doesn’t emit any radiation. The beam is not eye-safe, however, so special safety glasses are worn when servicing or othwrwise working near the unit. More information can be found on the MAYA website.